Here is a long awaited update about our greenlight campaign! We've finally reached top 100! And to be precise we've reached #62 place at this point! Out of 1900 other titles. And I think it warrants at least a little bit of celebration! We still aim for 50+ to be absolutely sure that we are accepted by Valve, but I think now it is only a matter of time! Please share this campaign with your friends and help us make it happen! And if you haven't voted yourself yet - you can find our campaign here, and hopefully vote! We all are personally very happy to finally reach the top 100 mark! It surely doesn't mean we are greenlit yet, but it brings us closer to it, and hopefully Valve will see the potential of this game and allow us on steam. 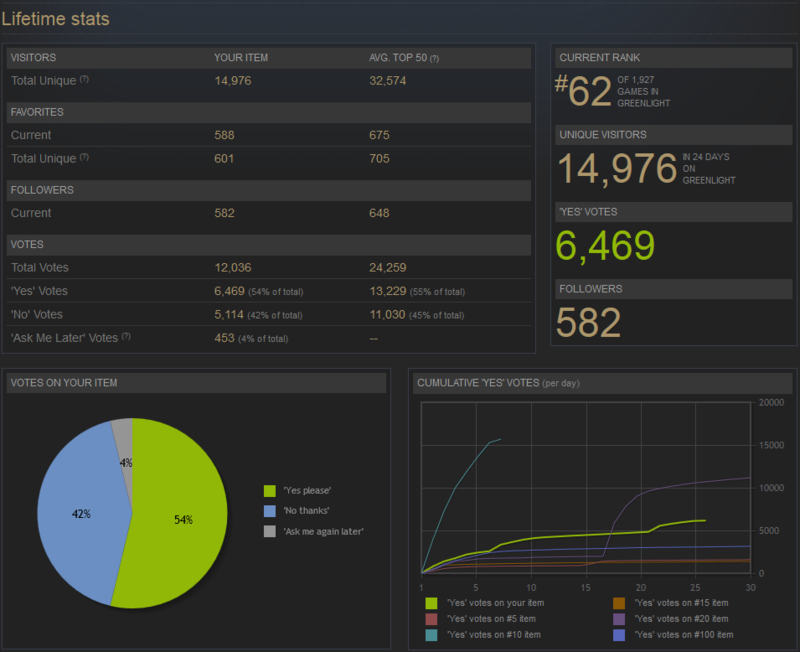 Re: We are in top 100 on Steam Greenlight! Finally we reached this goal. The rest is just a matter of time and good development of the game! I've seen a LOT of "indy games" with a nice very little community and good relationship with developper(s), with patch every week or so... until they go to Greenlight or Kickstarter or alike. Then, it's the fall. Less communication, less updates, less quantity and less quality ! But i feel confident about Void Expance ! Awesome job guys! Also, assuming you make it, do you have plans to actually integrate the steam API further down the road, or will Steam just be primarily a distribution point? I just know I <3 me some Steam integration and think it'd be awesome for the game further down the road for Workshop to be able to handle mods in addition to ease of joining multiplayer. The goal is to be greenlit! Yup, I think all these meta thingies on Steam such as achievements, trading cards and the rest are pretty fun, so we will definitely integrate them. I don't really know, though, what's the deal on Steam side, but if they allow us to do it we are definitely going to implement that. And workshop for sure as well. It will allow for the easiest mod installation and great database. The first goal was to get in the top 100 The second one is to be greenlit!